1981 Sackville Records original pressing, made in Canada. Featuring KEN WERNER, SANTI DE BRIANO, JOHN BETSCH. 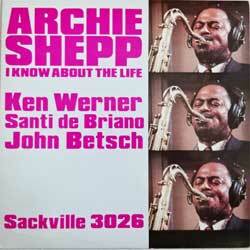 Tracks: I Know The Life 13'49, Giant Steps 8'03, Round Midnight 12'08, Well You Needn't 8'45. Состояние винил и конверт отличное.